يضمن فندق PKs Jungle Village الذي رمم في لزائريه قضاء وقت ممتع في هذه المدينة الخلابة سواء جاؤوا في رحلة عمل أو سياحة. يجذب هذا العقار ذو 1 نجوم، والذي يبعد 140 km فقط عن وسط المدينة و 140 km عن المطار، الكثير من الزوار سنوياً. سوف يعشق النزلاء موقع هذا الفندق، فهو قريب من أهم المعالم السياحية في المدينة . كما يقدم PKs Jungle Village الكثير من الخدمات لإغناء رحلتك في المدينة. إن متجر, خدمة غسيل ذاتية, متجر هدايا/تذكارات, مطبخ, خدمات بريدية هي جزء فقط من الخدمات التي تميز PKs Jungle Village عن باقي الفنادق في المدينة. تعكس غرف الفندق البالغ عددها 34 المنتشرة في طوابق جواً من الدفء والألفة.خدمات عصرية مثل بياضات, مدخل خاص, مناشف, غرف لغير المدخنين, مكيف هواء موجودة في بعض الغرف المختارة. يقدم الفندق مجموعة رائعة من الخدمات كمثل مسارات المشي, الغوص السطحي, حمام سباحة خارجي, تدليك, ملعب للأطفال، لجعل إقامتك تجربة لا تنسى. يشكل PKs Jungle Village بخدماته الراقية وموقعه الممتاز، قاعدة مثالية للاستمتاع بإقامتك في المدينة. PK's is basicall an upmarket camping ground. We stayed in a king room for $138.00 and there is a bed and a refrigerator. No Alcohol is allowed other than buying it at the bar. They will seize any if you take it on the property. No tea or coffee or cups for that matter in the room. No storage space for clothes or suitcase. The room does have hot and cold water but it only dribbles out of the shower. The surprise when we arrived at the room was while it has a sliding door they use a security type padlock on all the doors which is very unusual but I am sure they will give a good reason for this if asked. Just like the crap they spilled when asked why no tea and coffee and cups. We would never stay there again even if they invited us back for free. Stayed 3 nights but could have stayed longer as there is so much to do and see. PK’s Jungle Village had everything we needed. High points were massage, drinks from the bar, dinners and meeting other travellers. Only negative was the bed was extremely firm. Escaping technology was an added blessing! The main failing here was the showers and toilets. Toilets smelt and felt unclean. Shower was hot and good preszure. Showers dripped, couldnt stop them properly. Not sure about their alcohol policy. 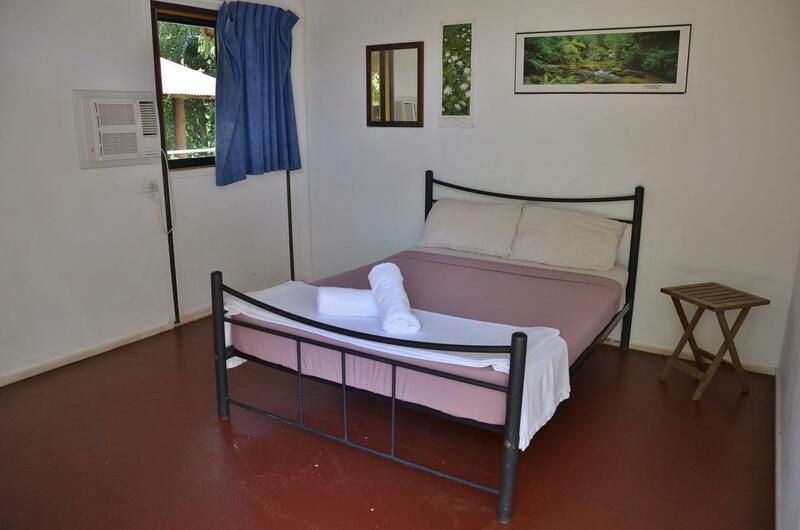 Cape Trib is as awesome as we thought, it was a last minute thing during high season and this was all we could get, Room was great and clean but the shared toilets/showers could do with some work. Once you are at Trib you are sort of trapped (distance) so you expect the prices to be dear. What the staff (at this time) didn't know they made up, probably works if you are not from Australia. 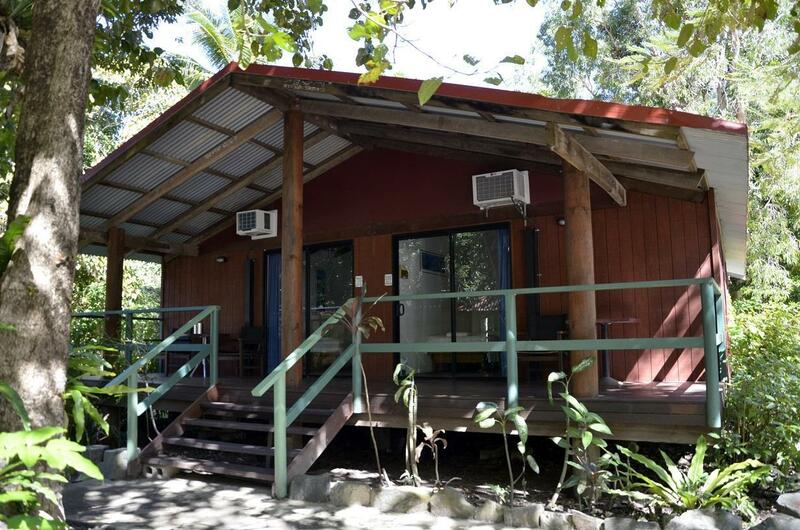 I've stayed ar PK's already twice while on the trip to Cape Tribulation. Really nice place that offers different budget options. 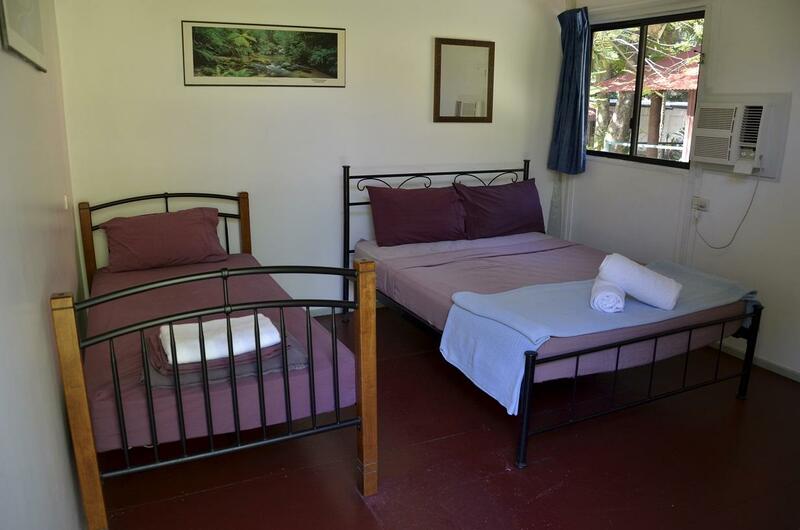 You can get a bed in the dorm, or separate suite or family cabin, even rent a campsite. 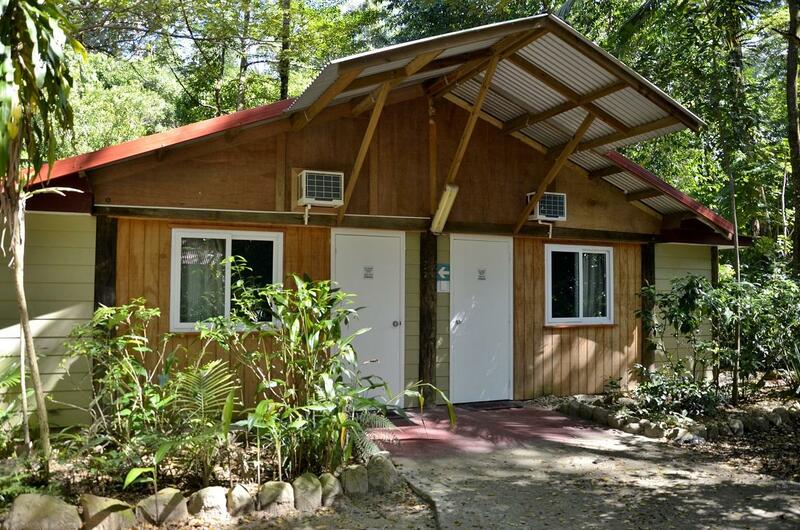 The site by itself offers all facilities you need, shower cabins, laundry, kitchen, bar, even the massage salon. There is a lovely peacock wandering around. The only one drawback is no Wi-Fi/mobile connection, but that is common for all places after the Daintree ferry. The nature around is magnificent. 2 great beaches. Staff is very friendly, I was allowed to use parking spot and the site facilities even after check out time. Will definitely get back. Great place that definitely offers value for money. Close to the beach and right in the centre of the village. Staff very friendly and helpful, room was very clean, lots of showers (shared facility) so you'll never find yourself i a queue. They have laundry as well. There is a pool for those not willing to leave the site for the beach. Billiards in the bar. Food in the bistro is delicious. 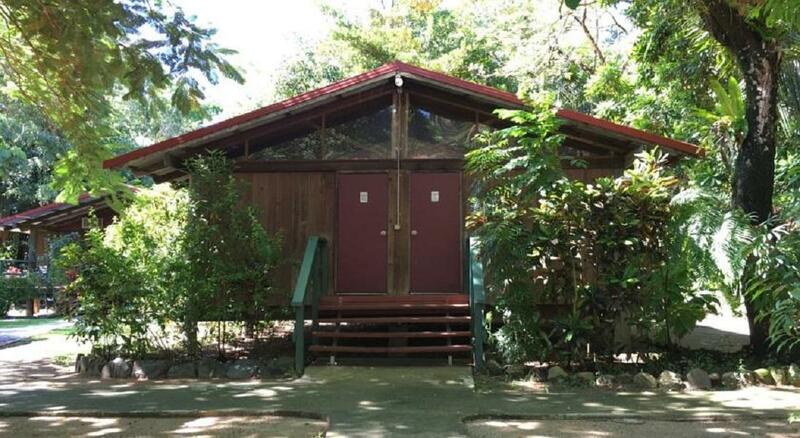 Only one problem - no phone/internet connection, but thats what you'd expect staying in the jungles. There is wi-fi (100mb $5), you can catch a signal in the bar. Would definitely recommend. The accomodation side was fine, me and a mate each had a queen room to ourselves, it was the bar facilities that lacked. At a backbackers bar I dont expect to listen to 60s and 70s music up until 9:30 when they closed, which is a bit early in my opinion. The food could also have a bit more flavor, not too far off good it just need something more. First of all, I can't understand why this place is only rated 1 star. 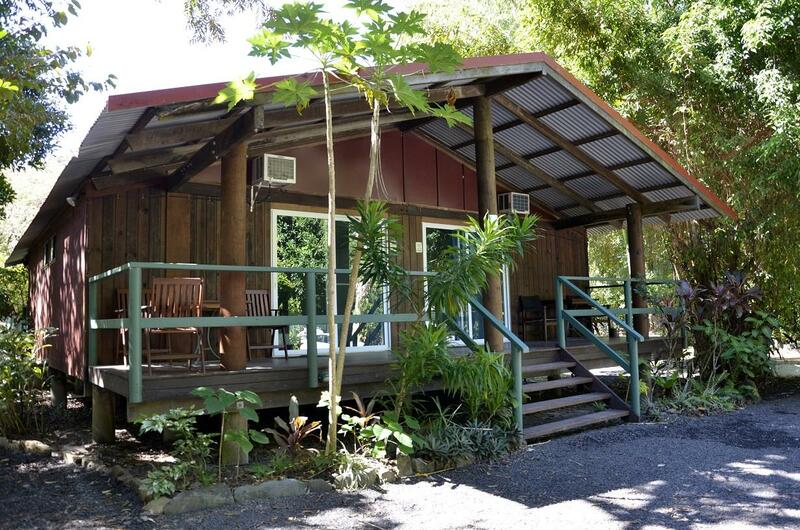 The location is very prime, opposite the Ocean Safari office, Turtle Rock Cafe, and it's connected to beautiful Myall Beach where you can watch the sunrise from. A few minutes drive to the Kulki lookout and Cape Trib beach. The bar and restaurant is amazing, the food is really great too. I stayed in a dorm and the sheets were very clean, showers are spacious and clean too. The place itself is massive and beautiful. I fully recommend staying here when in the area. Excellent, enjoyed every minute of it! Le backpacker est bien situé mais il est tenu par des jeunes inexperimentés. Ils étaient incapables de retrouver ma réservation faite via le site agoda bien que je leur avait donné toutes les références. Au moment du paiement, j'ai du les convaincre que j'avais payé un acompte et maintenant, je me rend compte que j'avais payé la totalité et que je ne davais plus rien payer.